I've been browsing this board for a few months so I figured it's time I made some posts, and with the ETL going on I've managed to find time to start painting again. I hadn't painted or played for a long time until recently - and by a long time I mean 15+ years. I used to play back when I was younger in the days of 2nd Edition in the '90s but stopped when I was 15-16. Now I'm in my thirties I heard the voice of Sanguinius calling from the storage boxes (or more accurately my better half an I ended up in a game store and the shiny boxes proved too tempting), and I brought my collection back into the light. 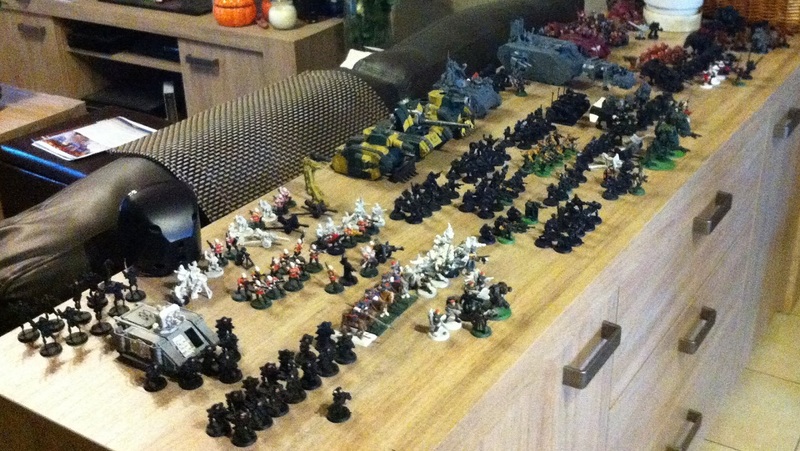 Having spent a couple of months going through the changes from 2nd Edition to 7th, and working out which of my models would still be legal and which need modifying, I'm looking at 7000+ points of Imperial troops with half old and half newly bought. The majority of those are Blood Angels, with about 2k Imperial Guard and a handful of Marines I'll probably paint up as Imperial Fists as an allied detachment as they're not in our codex. Anyhow, I'll try to update this with pictures as I get the painting done! As a baby of 3rd edition, can't wait to see all your 2nd Ed goodies! Centre: I vaguely remember this Apothecary being covered in so much paint the only way I could pretend detail was still there was to paint black lines where edges of armour should be. Right: Another case of missing detail. In hindsight, priming, painting and re-priming this terminator wasn't the best idea. 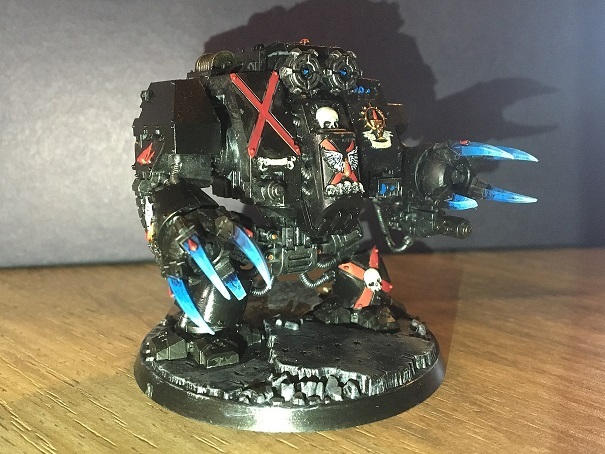 I think there's an old metal Captain hidden under all that black. If I could tell my younger self anything model-related it would be to yell "Less paint!". Edit: Hopefully the pictures aren't too big, they should scale down when the thread is viewed. And apologies for the poor quality, I only have my phone. Edited by Thoridon, 27 June 2016 - 10:49 AM. 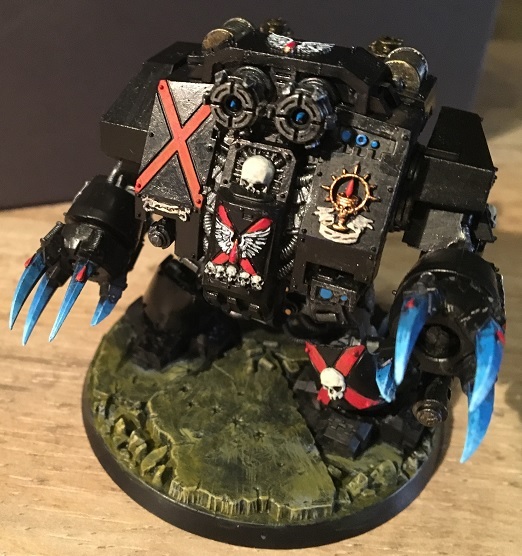 Am i the only one who think it would be awesome to have a full army of 2nd ed models? Welcome back to the light brother. Looking forward to see your painting. Also there's something satisfaing abouth a nearly all lead army. In case of emegerncy your trasnport case can be used as a 15kg bludgeon! There were originally 10 with green trim and 10 with black, but it seems only 5 of each survive... minus a few limbs and weapons. 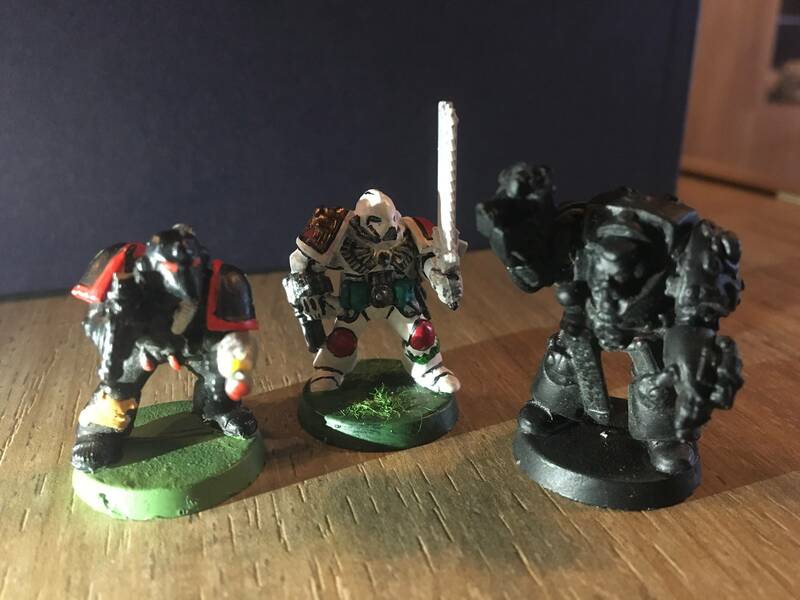 I'm tempted to leave these guys painted as they were for nostalgia, though the Sergeant probably deserves a new arm at least. I wonder if I can find something bionic amongst all my bits. I'm pleased with Tycho considering this is his 3rd paint scheme. He was golden originally, but very bad (on par with the DC marine in the first pic!) 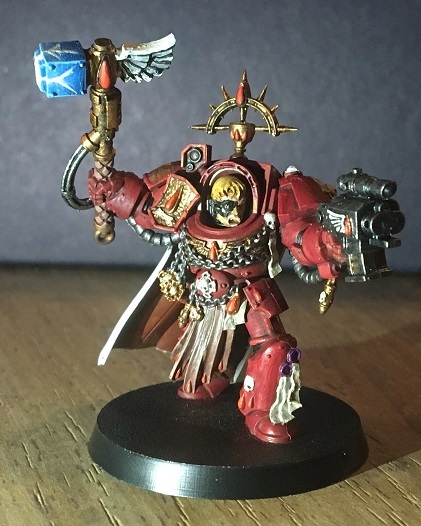 so he got primed and repainted dark red as a generic captain for a custom chapter I was changing everything to 15 years ago. After seeing the current codex has a DC version it seemed the sensible way to play him if I ever wanted to, so he's now been revived in black! Oh, and I'm rebasing all my old stuff onto 32mm to match so you might notice the fantastic conversion there. At least it adds a little height so he's not shorter than the new models! 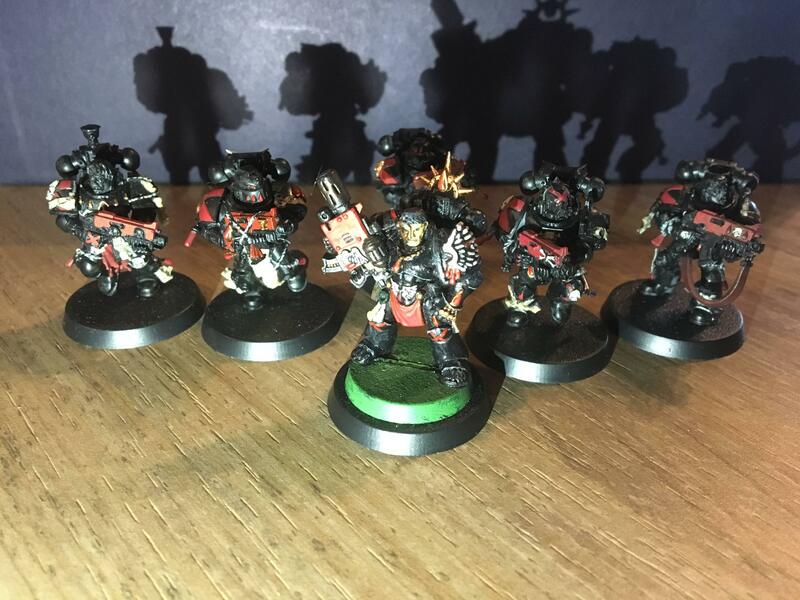 I thought he deserved a few buddies so picked up a box of 5 DC marines to accompany him with bolters. A small unit to exploit Relentless; rapid fire bolters and charge. Might not be the most points efficient unit with Tycho in but it should be fun now and then to point towards enemy infantry! I halted painting on them for now as they were in that state before ETL started, so I'll finish them off when ETL ends. Edited by Thoridon, 27 June 2016 - 12:01 PM. 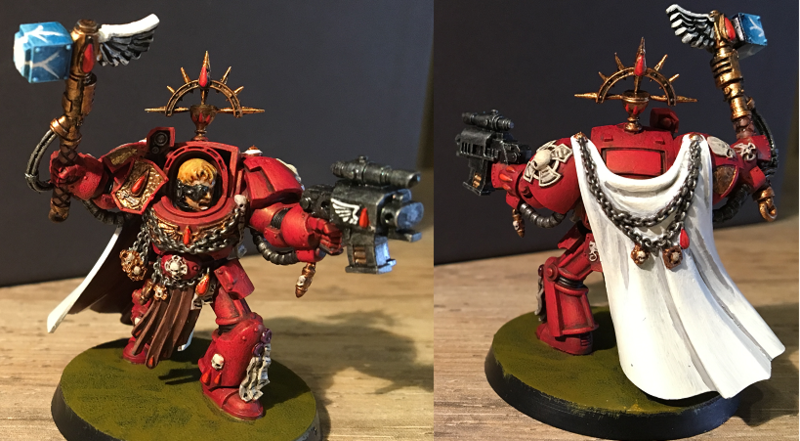 I considered adding a Power Fist to that squad but decided it would be an unnecessary points increase. If I use those bolter DC on foot it'll only be with Tycho and he's not a character I'd be sending at anything big and tough with strong armour. I'd point them at targets where rapid fire S4 bolter shots followed by S5 charge attacks would be lethal even with a lack of combat AP. If they then got counter-charged by something tough they'd just have to do their best to hold their ground until a specialist unit could reinforce. I'd rather spend the points on an extra power weapon for a specialist unit going monster hunting. My old Blood Angels are at the back. 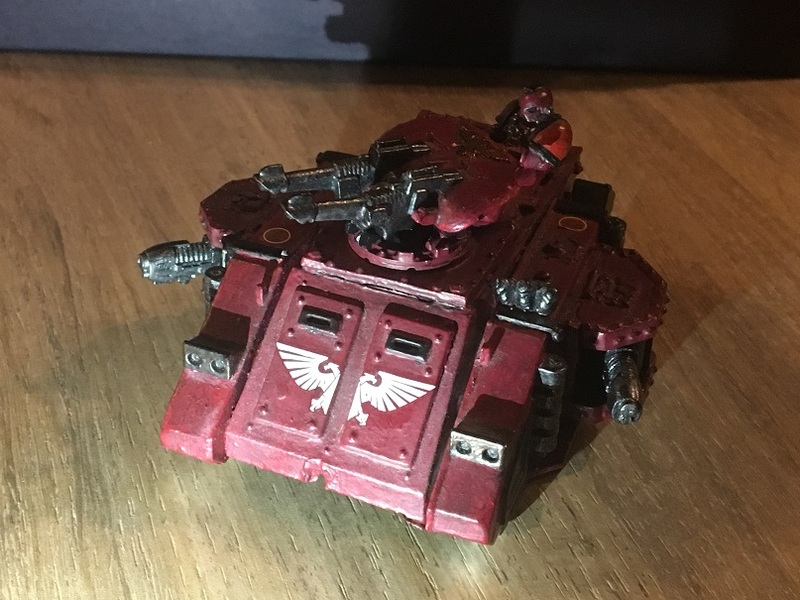 That dark red you can just about see was the colour I chose for my custom chapter in the old repaint, which handily is pretty close to the colour Flesh Tearers seem to now have, so some of them will just have a quick touch-up and become Flesh Tearers. 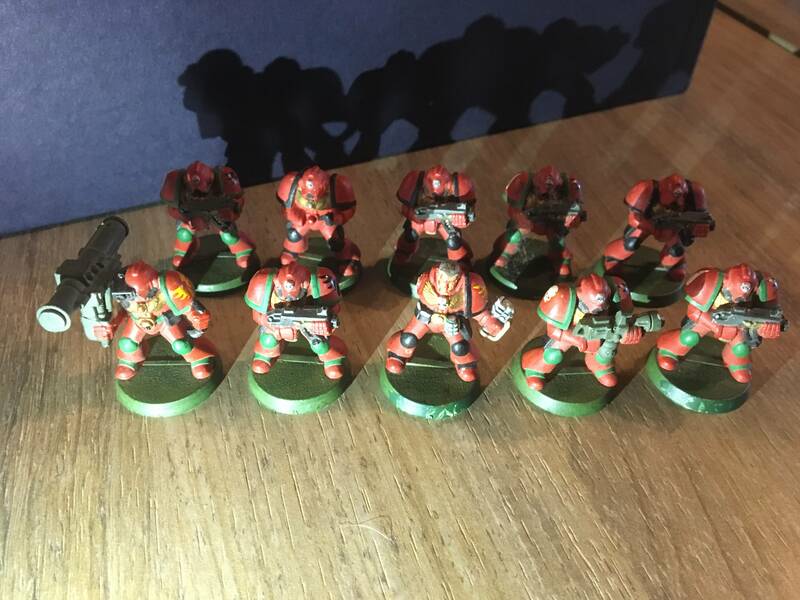 Anyhow, I've added quite a few new Blood Angels models since that photo, but even then they were higher in points value than all those Guard! Edited by Thoridon, 27 June 2016 - 01:57 PM. Edited by Thoridon, 27 June 2016 - 02:22 PM. Nice. Pretorian guards. So old school! Yep, I really need to get those finished up Wish I had more of them! I think of all my old models I'm glad they remained intact, none missing from the original boxed set. He's even further from being finished than Cassor, but this early photo of the progress on him will show the base colour of the red I decided to use (though it still needs plenty of shading and highlights). 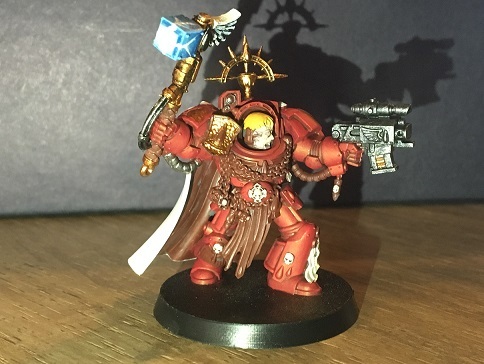 Nice lightning effect on the hammer and the metallics look cool too! You are doing awesome painting at a quick place. Keep the views coming! Also really awesome to see the older stuff too. I'll be following this thread. All around well done! Love the hammer effects. Not too far off with him now. 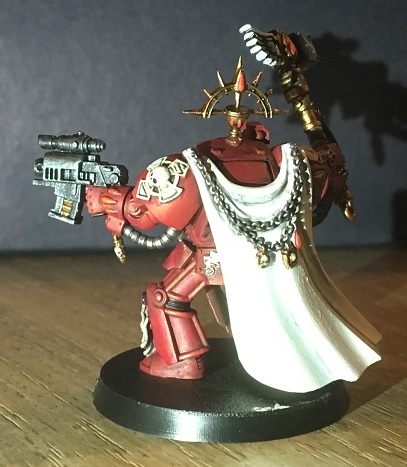 His face needs a little work, the red armour needs a slight highlight after I added a black wash and I need to highlight the leather hanging from the belt more (though the light in the photo drowned that part out). Cloak needs some touching up too, to blend in some more shadows. Just noticed the bit of black wash I added to the hammer dulled some of the 'wing' a bit too, so that'll need a retouch. Also tempted to repaint the top of the 'wing' bronze to match the hammer shaft, that bold white might be a bit too much. Edited by Thoridon, 29 June 2016 - 08:02 PM. Looking great man! Love the hammer! I think making that part bronze too would look good, but def not necessary imo. Alreadly looks solid as is. In the meantime, here's another of my old models - a somewhat modified Predator Annihilator. The main issue seems to be that plasma cannon sponsons are no longer possible, so I need to find some spare lascannons to stick in there as a tri-las Predator. Edited by Thoridon, 29 June 2016 - 08:56 PM. Looking good Thor. An impressive army is coming together! I've had a busy month and not had time to paint so I'm a bit behind, but with under 2 weeks to go I'll be making sure I get the ETL vow finished now. A few things to touch up on Cassor and then on to Squad Raphen. Edited by Thoridon, 04 August 2016 - 11:22 AM. Thanks He's Captain of the First, white seemed appropriate! Cassor good to go, though Vallejo black seems to have quite a gloss effect so I'll have to see if a matt varnish dulls that shine down a little.